The New Post office on Phi Phi Don Island has just opened up in the village December 2010. This smart new facilities allows you to send letters, postcards, aerograms, parcels to domestic and international destinations and certified, registered and Express delivery items. The New Post office is located 150 meters from the main pier and is just behind PP Princess Resort. 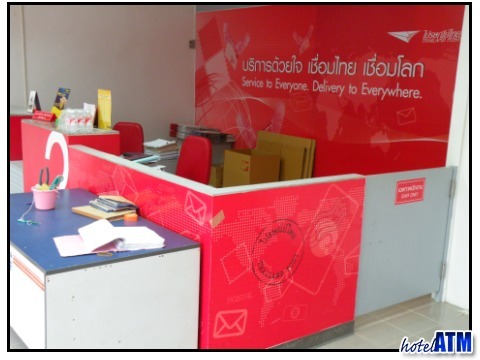 The Phi Phi Island Post office opened a new smart office on Phi Phi Don Village. This unique facility comes after 2 decades of when the old post office was located opposite Moskito Diving. Phi Phi Ley is not inhabited. Laem Tong, Long Beach, Loh Bagao all use the post office in Phi Phi Don Village. The massive improvement to the island's postal service is un questioned. Before the Post office handled incoming and out going mail, primarily stamps and postcards for tourists but now it has a full and varied service equivalent to post offices on the mainland. As Phi Phi has grown as a holiday destination it needed a decent postal service that could cater to both tourist and business. The smart new air-conditioned offices have created a one stop location for everybody to organize their mail and send and recieve parcels. The new post service allows the tourist to send their holiday postcards, letters and aerograms with ease with over the counter stamp purchase and using the bright red letter box outside. You can buy fold down boxes to send items up to 45cm X 40cm X 55cm. There are 6 smaller types of boxes available to ensure your package gets home in one piece. There are also Thai Post office souvenirs, mugs, key rings and of course first day covers for the Philatelists. All of these seem to be small and an ideal size for people on holiday to carry home.